Carpet, Hardwood, Laminate Floor Store serving Cupertino, West San Jose, Campbell, Saratoga, and Sunnyvale. Whether you’re looking for high-quality hardwood, laminate, vinyl, or carpet you’ve found the right place. At S&G Carpet and More in Cupertino, we’re proud to provide one of the area’s largest selections of flooring products. We’re dedicated to helping home and business owners throughout the local area find high-quality, affordable flooring solutions that meet their demands. We’ve been the leading source for flooring in the greater Sacramento area since 1948 and are pleased to offer the same great selection in our Cupertino showroom. 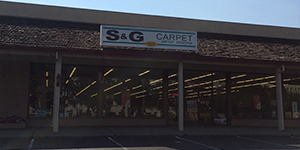 The staff at S&G Carpet and More in Cupertino is specially trained to help you find the right flooring products for your residential, commercial or rental space. Our friendly, knowledgeable staff will be happy to help you select flooring that meets your needs, budget, tastes and lifestyle. Our showroom features some of the area’s largest display floors so that you can get a better idea of what our flooring products will look like in your space. Of course, we also have thousands of samples that you can borrow to try out in your own home or business before making a final buying decision. And remember, we don’t just sell flooring-we install it, too! From sophisticated patterns to colorful solids, our carpet styles are available in a wide range of shades, tones, and hues. We offer the largest selection of carpet in the Pleasanton metropolitan area, and are constantly on the lookout for opportunities to buy good quality carpet at below market prices. We offer the finest carpet buys in the Pleasanton area, including numerous designer colors, patterns and textures, to help you find the perfect carpet for your Pleasanton area home, rental or office. Hardwood floors come in a wide variety of wood species, colors, and widths. Besides the classic North American hardwoods (such as red oak, white oak, maple, and ash) many manufacturers now offer exotic hardwood species from around the world. The staff at S&G Carpet Pleasanton are hardwood experts. We will answer all your questions and help you select the right hardwood flooring for your home or office. Our guaranteed installations ensure that your hardwood floor will last for years to come. The choices might seem endless when it comes to flooring, but S&G Carpets Cupertino will help you make the best, most practical and affordable decision for you. Unlike our competitors, who might surprise you with “add on costs,” we know that the bottom line cost (not the per foot cost) is what is most important to you when you are considering the purchase of carpet, hardwood, laminate or vinyl flooring. We give free, honest, complete, and accurate estimates. From our warehouse location in Cupertino, we provide the largest selection of carpet, hardwood, laminate, and vinyl flooring in the Cupertino area, and serve customers in the communities of Cupertino, West San Jose, Campbell, Saratoga, Sunnyvale, Mountain View, Los Gatos, Santa Clara, and Los Altos Hills.